Reserve our comfortable space for your event. 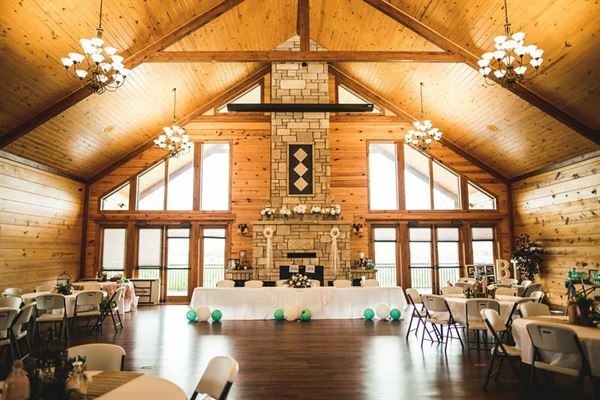 Life’s Finer Moments has a beautiful event lodge and rental cabins available for your wedding, reunion, reception, meeting, and much more! Cabins are available for separate rental or in combination with your special lodge event. We are on 40 acres, so use our outdoor space for unlimited capacity! Beautiful location, easy to work with owner. It was a little bit of a pain to transform the wedding area to reception but it went okay. Only way to get around it is to have an outdoor wedding and have reception inside. Also they do not allow alcohol which our guest seems to survive with out it. I had my wedding here in December 2017! Everything went as planned and the service I received was more than quality! They even have cabins on site which were fun for the bridal party to stay in the night before! I definitely recommend this venue! We rented the cabins for our out of town wedding party to stay in for the weekend and they absolutely loved it! We were so impressed with how comfortable, clean, and prepared everything was. Our wedding party kept saying they wish they could have stayed longer to just relax and enjoy the cabins a bit more! Would highly recommend a stay there to pretty much anyone! We hosted my daughter's wedding reception and dance at Life's Finer Moments near Clay Center, Kansas. We could not have asked for a more perfect setting, more beautiful facility or more helpful staff. And the beautiful country sunset was the envy of all of our "city" guests!! You have to see this place to believe it!! We could not have been more pleased with our choice of venue!! We will continue to recommend it to anyone looking for a perfect location for an event of any type. It is the ideal place to create everlasting memories!! We've used the facility and the cabins several time. It is perfect for our family gathering. The facility is beautiful and very well equipped. My sister in law was so impressed with it that they are using it for a wedding reception this fall. And I have it booked for our gathering in 2018! Special Features: 40 acres with ponds, cabins, walking trails, firepit, and picturesque sunsets. Outdoor or indoor event options.